GIS Mapping Services for St. Clair County Transit District - St. Louis Engineering Firm | Thouvenot, Wade & Moerchen | TWM, Inc.
GIS Mapping Services were conducted by TWM as part of corridor studies for existing, proposed, conceptual, and under construction off-road trails that route throughout St. Clair County for the District. Over 80 miles of trail were mapped within the GIS. 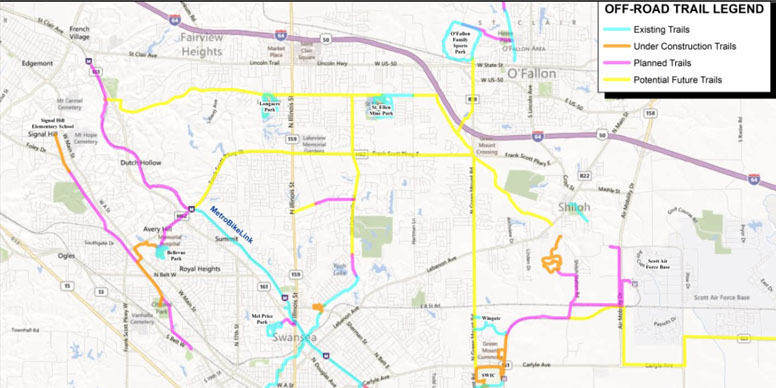 Gathering data from multiple sources, TWM built a geodatabase that held data to aid in planning future bike path routes throughout St. Clair County. In addition to gathering data, TWM created data within this GIS product that helped to make this geodatabase vital for planning purposes.